Human trafficking remains one of the three most profitable criminal activities in the world, generating $150 billion a year. These profits find their way into the formal financial system, opening opportunities for anti-money laundering actions. 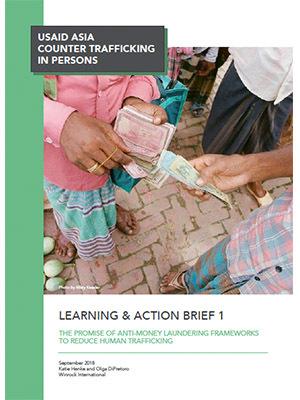 Yet significant gaps exist in understanding the links between trafficking in persons (TIP) and money laundering and how to leverage those links to effectively attack the criminal enterprise of trafficking. generated revenue and over 2,000 identified victims of human trafficking. This brief presents two of these typologies, focusing on the seafood sector in Asia. It also highlights typologies as one tool used by financial institutions and discusses how other actors, including private sector, civil society, government and law enforcement, can use this type of research to strengthen their counter-trafficking approaches.